Today, Cerruti 1881 produces an extensive line of ready-to-wear menswear that remains true to the brand's distinctive ethos of fine fabrics, meticulous craftsmanship and intelligent design. The range of products under the brand includes fragrances, leather goods, watches, jewellery, eyewear, ties, shoes and writing instruments. While remaining true to the brand's distinctive ethos of fine fabrics, meticulous craftsmanship and intelligent design in its offerings, Cerruti 1881 has embraced innovation and creativity to become the quintessential contemporary menswear brand. The sense of design and the search for increasingly sophisticated fabrics contribute to the natural elegance of the label. The Cerruti 1881 collection is aimed at men who appreciate style and elegance, but also the finer details like fabric quality and finishing. Reminiscent of great voyages, the most striking detail of the timepiece is the graphic dial. Featuring boats at full sail on a radiant blue sea, the timepiece beckons the intrepid traveller to embrace all the adventures that life brings him. The delicate rose gold details on the sailboats perfectly complement the rose gold indices and the case of the timepiece. With a sturdy brown leather strap and an ornate crown, Albiano is designed for men who seek to broaden their horizon. Whether you are dreaming of rowing a canoe to the edge of South Pole or leading the game of boardroom number crunchers, Albiano instills a sense of adventure— connecting the wearer to a history of great voyages and expeditions. Cerruti 1881 Mezzano is the quest for ergonomics that resulted in a smart timepiece. Comfort is at the fore of this timepiece that is essentially designed for everyday use but is also delegated for special occasions. Intuitive and functional, the timepiece reprises the favoured colours of the season—brown and ash grey with unmistakable rose-gold detailing. The silver case complements the rose gold Roman indices set in the brushed grey backdrop. 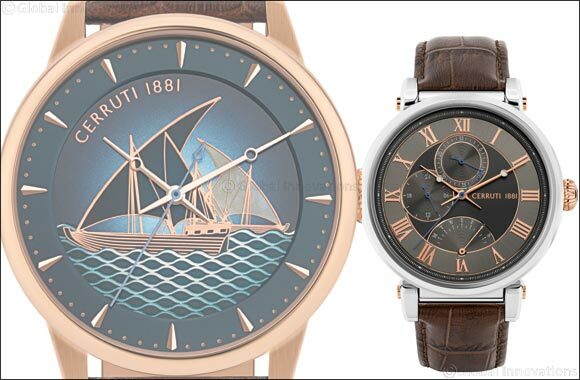 The Cerruti 1881 man experiences unmatched freedom and functionality with the Cerruti 1881 Mezzano, which is equipped with three functional counters and a brown leather strap with matching stitches. Exuding confidence and decked in hues of gold and silver, this Cerruti 1881 timepiece is gorgeous beyond words. To a connoisseur, CERRUTI 1881 Corniglia presents its complete beauty and refinement. Great care has been taken to imbue the timepiece with lucidity and lightness that can be experienced even in the smallest of details like how the lugs seamlessly melt into the unique bracelet and in deftness of the beautiful link bracelet that is attached to the timepiece. The bejeweled case boosts the radiant mother-of-pearl dial and four gleaming indices. The Cerruti 1881 motifs in the dial enhance the appeal of Corniglia, making it the perfect cocktail timepiece of the season. To complement the boldness, strength and femininity of the Cerruti 1881 woman, the Maison equips her with the timeless Avola. Streamlined femininity that bears the exuberance of Cerruti 1881’s superior artistry, Avola has sinuous lines that elevate the beguiling silhouette of the timepiece. The grandiose guilloches highlight the silver Roman indices that are smartly placed in the deep blue surface of the dial, while the exceptional link bracelet asserts charm and lucidity that adds to the fine nuances of the timepiece. Sensual and essential in equal measure, the timepiece is for every fashionable woman. Redefining aesthetic candor in a fresh breath of fashion, this Cerruti 1881 accessory is all about striking the right balance. Tactile features render a distinctive appeal to the jewellery that is designed keeping the Cerruti 1881 woman in mind. The most notable detail of this jewellery is the pendant that has beautiful Swarovski crystals sealing the intersecting lines of the cushiony silver circlet housed inside the Cerruti 1881 ’C’ logo. The riveting pair of earrings, bracelet and ring complete the jewellery set. Elite, stylish and dapper – Cerruti 1881 scripts a new chapter in power dressing with an exciting collection of accessories. Style it as an accompaniment to your timepiece or as a stand-alone fashion fixture – this Cerruti 1881 leather bracelet – is sure to get you all the attention. Whether you are a suited and booted corporate titan or a hoodie-wearing millennial entrepreneur, this double braided black bracelet with metal inserts is the perfect accessory to elevate your look. And for those special occasions that you do decide to dress up, these smart Cerruti 1881 cufflinks is all that you need to look polished and perfect.